People who wear dark suits have something in common with dinosaurs, it turns out: their dandruff shows. The feathered raptors that lived in the Cretaceous might have appreciated Head & Boulders shampoo but lacking a prehistoric Procter & Gamble, they probably had to settle for scratching madly as their skin flaked off, rather than shedding in a single neat sheet like reptiles. 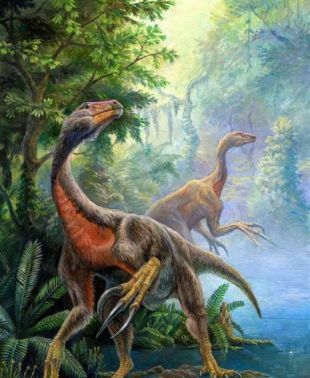 It makes sense that "feathered dinosaurs" (which may have been "all dinosaurs") suffered from dandruff, as reported in Nature Communications by Maria MacNamara of University College Cork, Fucheng Zhang of Linyi University and others. Flaking skin, which has embarrassed people and delighted retailers for generations, happens to other mammals and birds too. 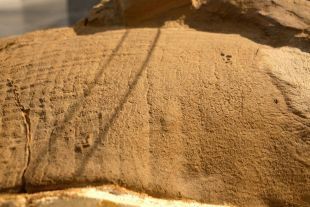 Skin flaking is a normal part of feathering. Like our hair, when one feather falls out, another takes its place. The new feather grows through a "pin sheath" that disintegrates into flakes as the feather breaks through it. Another normal part of feathering is a corneous layer characterized by incessant shedding. It's probably itchy. The upshot of all this is what looks like dandruff on their avian skin. Now we know that a feathered micro-raptor about the size of a chicken experienced the same thing 125 million years ago, because scientists studied its extraordinarily-well preserved fossil skin under a microscope and saw what they believe to be shedding skin flakes, i.e., dandruff. “It shows that they shed their old skin in clumps rather than in one go, like modern snakes and lizards," stated Dr. Michael Benton of the University of Bristol, a.k.a. the scientist who brought us the dinosaur tail preserved in amber in late 2016. (That tail was from 99 million years ago. Last week Benton also reported, also in Nature Communications, that during the Triassic, there were two main events of dinosaur diversification). But we digress. What they saw under the microscope was outer skin cells in a state of shedding ("desquamating epidermal corneocytes"). This was observed in fossil skin samples from feathered but non-avian dinosaurs Beipiaosaurus, Sinornithosaurus and Microraptor; and in the bird Confuciusornis which dated to the Early Cretaceous. So, bird precursors and non-bird dinosaurs both tended to shed skin in small flakes, as do modern mammals and birds. Did all dinosaurs have feathers, or didn't they? We will never know, but those silly pictures of fluffy T-rexes with bright pink stripes are probably inaccurate. Monster dinos like it may have had sported some fuzz around their ankles or neck or both, and otherwise were garbed in scales. That said, after an early Cretaceous dinosaur not ancestral to birds was found in Siberia with fossil feathers and scales, it is now widely thought that all dinosaurs had feathers in the sense that all mammals have hair – some are thickly coated and some have precious little. In short, if they all had feathers, from velociraptor to pterosaurs, all probably had dandruff. In a final note, which came first, the proto-chicken, the egg or dandruff? It turns out that shedding ("desquamation") in small patches is also a thing in crocodiles and turtles, the team explains. In other words, possibly this propensity to shed skin and develop what advertising agencies call "dandruff" goes back to the ancestor of reptiles, crocodiles, turtles, birds and us all.